Wait, there is one more group! This year Portland Experimental Theatre Lab takes you out of the theatre for a little bit. You can try and catch Wittgenstein's Mistress tonight, but if last night was any indication all three showings will sell out very quickly. 27 lucky people (9 per show) get to take this 15-minute audio tour from one of Portland's newest performance groups. This work is a bi-coastal collaboration between recent New York transplant, Rebecca Lingafelter, NYC Performance Lab 115's resident sound designer Mark Valadez and their NY Director Meiyin Wang. Meiyin already flew back east, but you can read more about her here. 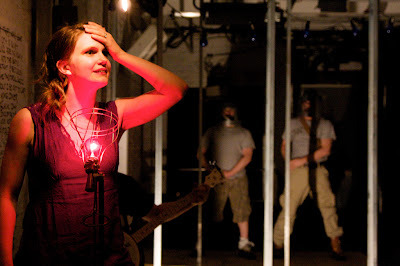 Each audience member gets outfitted with an ipod and heads into a world that blends sound, movement and imagery while following a woman who claims to be the last person on earth. We love when new performance groups move to Portland!